I was honored to be invited and participate in the Long Island 2 Day Expo. The West Islip Fire House’s hall buzzed with sponsors, walking teams, and fun swag for the walkers. I was given a table to display my book, Hug Everyone You Know, and share my story. 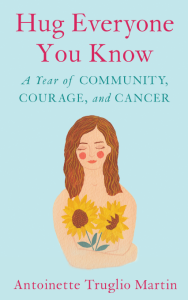 Five dollars for each book sold was donated to this grassroots organization dedicated to supporting Long Islanders in their fight against cancer. I met wonderful people who shared their stories and exchanged hugs and tears together. Jessica Lore won the give-away raffle; A Book In A Bag! Jessica represented Thomas Scully Foundation that supports families dealing with childhood cancers. It was a great night of networking, celebration, and gratitude. The 15th annual Long Island 2 Day Walk will be held this Saturday, June 9th. It is a 13.1 mile walk through scenic neighorhoods, across the Smith Point Bridge and culminating at the Smith Point County Park Marina. 100% of the funds raised by walkers stay on Long Island to be distributed by local breast cancer service & support organizations. What a wonderful fundraiser (and awareness raiser)! I am so glad that you were able to be a part of it!